KATHMANDU, Nov 28: The Nepal Stock Exchange (Nepse) index plunged 64.55 points, or by 4.21 percent, on Sunday to close at 1,469.48 points. 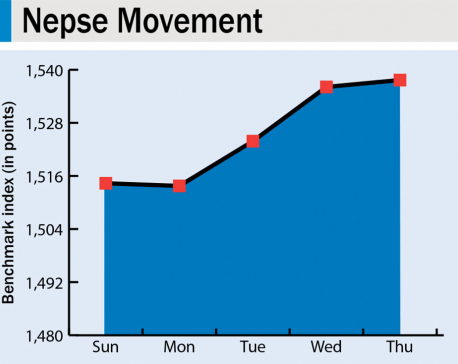 Amid intense selling pressure that drove the market down by 3 percent within an hour of trading, Nepse imposed a circuit breaker to suspend trading for fifteen minutes. 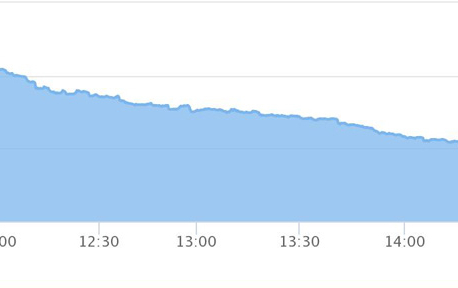 The trading resumed at 12:02 pm. The market has been on a downward trend for the last five weeks. While the liquidity position of the bank and financial institutions, which is gradually tightening in recent days, has been blamed for the bear run, analysts say that the selloff of stocks from the small and novice investors following the correction has dragged the market down. Earlier on July 27, the benchmark index had climbed up to a record high of 1,881.45 points. While there has been some up and down in the market in the subsequent days, the market started observing steep decline from the first week of October. The price of the listed companies goes down when they resume trading in the stock exchange after distributing dividends which has also contributed to the market slide, according to market analysts. As many bank and financial institutions have distributed huge stock dividend this year to meet the new capital requirement, their share price adjustment after book closure has driven down the market. All trading groups ended in the red zone on the first trading day of the week. While Insurance group shed the highest 562.94 points, the sub-index Hotels group ended 146.04 points lower. A total of 1.48 million units of shares of 128 companies worth Rs 964.56 million were traded in the market on the day through 6,382 transactions. Meanwhile, Nepse has issued a statement saying that its attention has been drawn toward the bearish trend in the secondary market. “There no need for investors to be discouraged,” the statement added. 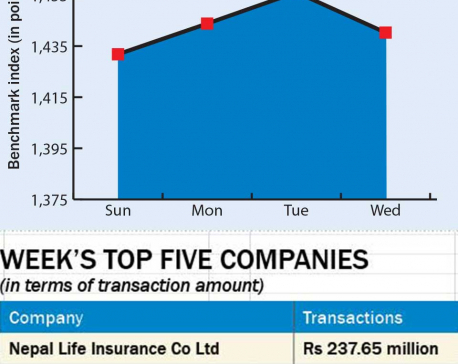 While a stock exchange company generally does not comment on the market movement and stock price fluctuations, Nepse has been issuing statements frequently when there is volatility in the market. Nepse officials argue that they have to issue statements to caution investors. "The market has been going down rapidly in the last few days and lost more than 60 points on Sunday alone. We need to advise investors, particularly small investors, not to panic," Sitaram Thapaliya, the general manager of the Nepse, said.